How you harvest the herbs will vary from plant to plan. You can’t go wrong with basil. You can cut leaves from the top to make the plant bushier or cut them from the bottom to make it grow taller and more slender. Go for the leaves that have started to fade as you can still get flavor out of them before they die (or cut them to put them out of their misery). If you want to take an entire stem, rather than cut individual leaves, you can do so if you follow a simple rule. Take a look at your basil, notice that the basil leaves grow in pairs opposite one another across the main stem. As the leaves grow, the plant will begin growing new stems where the leaves attach to the base stem. Those are new stems, so if you want to trim off an entire piece, you can do so by cutting the base stem above those leaves. This will tell the plant to begin growing the new stems with vigor. Finally, don’t cut off more than a third of the leaves at any one time or you run the risk of killing it. 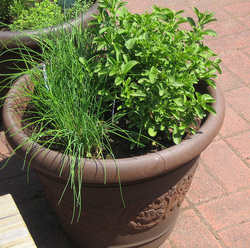 Mint is an herb you want to cut from top to bottom, ideally staying near the top if possible. The more you often you cut, the more often it'll start to branch out. It has a tendency to grow very quickly so you can harvest it frequently. If you want to take the entire stem, cut the stem about an inch above the soil. It's a perennial plant, so it'll keep coming back and back year after year (in theory). Just pinch off the leaves as you need them. If you see any flower stems, cut those off after they bloom in order to promote additional leaf growth. In and around early fall, stop harvesting so the sage can harden for the coming winter. These herbs are all bushy and can be harvested in the same way. Whenever you need it, just trim them at the base and use. Do this before the plant flowers and remove any flowers you may see. Also, with the chives, leave at least two inches to the base to have it regrow. Again, remember the 1/3rd rule – don’t trim more than a third of the plant or you run the risk of killing it. Those were the herbs in our garden but most herbs follow the same rules of harvesting. Don’t trim more than a third off at any one time, harvest after the dew has dried but before the sun has dried them out, and trim before they flower and go to seed.